A golf handicap card is issued by a golfing association indicates a players golfing ability. A golf handicap card will contain a player handicap, their actual handicap, name and club information. A handicap card is your proof that you can play golf to a certain standard. Before booking a tee reservation at a course you are advised to check if there is a handicap limit. It is also advised that you check with the club Secretary if your handicap card allows you to play in open competitions as, on occasion, a golf club will insist that the handicap card is issued from a traditional golf club. There are no official rules relating to this and it is therefore at the discretion of each club. Our golf handicap card has never been refused. 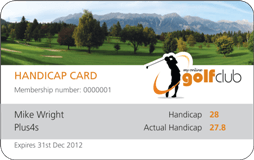 You can obtain a recognised handicap card here at My Online Golf Club. Please click here to register or sign in if you are already a member.